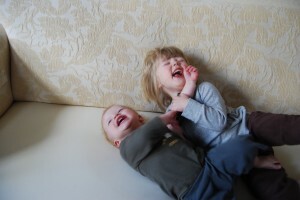 What to do with two revved up kids during the cold wintry afternoons? (-13 F this morning) Pull off all the couch cushions and wrestle, of course. Sometimes we bounce like we’re on a trampoline, but mostly we giggle and roll about. It’s been a while since I posted, and I know many folks who like to see what the kids are up to, so a pottery free post today while I get back into the swing of posting things on the site. What sort of things do you do to fend off the crazies of winter? This entry was posted in life, Uncategorized and tagged kiddos on February 1, 2013 by Jennie. Being creative avoiding cabin fever :).